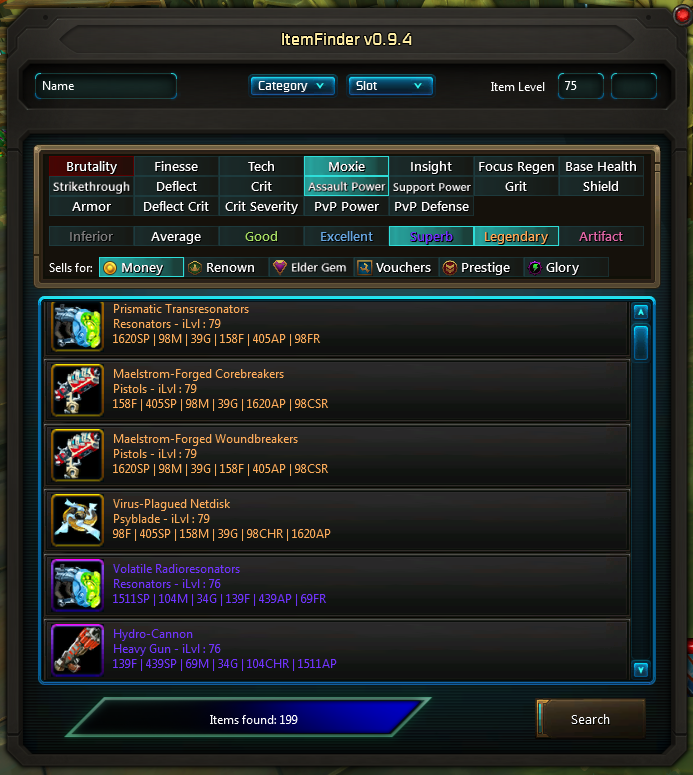 Like GalaxyLibrary, this addon uses the Carbine API to allow you to search through all the items currently in the game client. While you can search any item in game, it is a lot more oriented towards gear at the moment, as it was originally meant as a tool to create loot lists. For example, you can use filters to select only items of a certain name, quality, item level range, and include or exclude certain stats on items. To use, type /itemfinder or /if. Right-click on a stat button to exclude items with that specific stat. You can filter out old pre-drop4 raid loot by selecting only items that sell for money, as the legacy gear usually sells for glory. You can select multiple categories or slots at once in the drop-down menu. Righ-click on an item to get the link to chat / preview item menu. You can hover over most part of the UI to get info tooltips. This addon is currently in beta, all bug reports or feature requests are greatly appreciated. Updated filters to reflect Drop 6 (F2P) changes. Tuned search speed parameters to improve performance.